VIVA SOL. Translated: "Long Live the Sun." And long live all the fun you can have under it. Viva Sol creates memorable outdoor experiences by combining craftsmanship with gamesmanship. Our sole passion is taking time-honored hand toss games to a higher level of performance and artistry. Constructed from 100% wood and steel designs, the entire Viva Sol collection is built to endure, and to bring family and friends together. 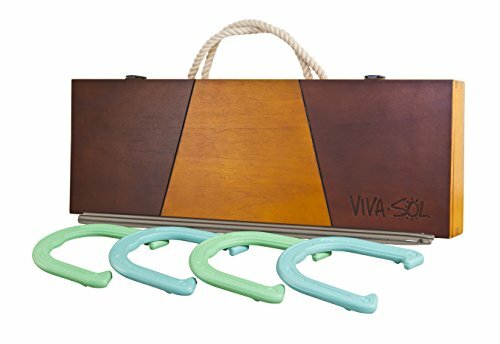 Take Viva Sol to the beach with our portable horseshoes set. It features a beautifully designed all wood case with poplar veneer, walnut finish and molded foam lining. The set includes professional grade, (4) forged steel horseshoes and stainless steel, (2) rust proof stakes, oil rubbed bronze latches to close the case and heavy duty hemp rope handles.